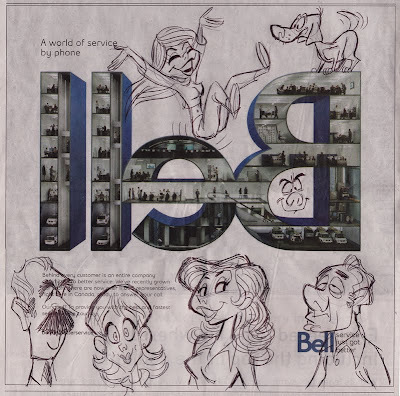 The Cartoon Cave: It's Doodle Time! These are great! 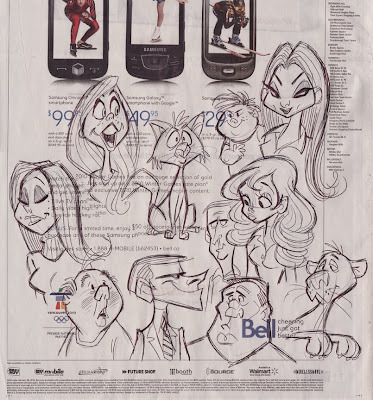 I love looking at great doodles, there is a lot to learn from them, thanks for sharing them. awesome sketches, i've come to realize that i haven't sketched in a LONG time. Spending too much time with Maya i think. I should spend more of my break time from the computer sketching instead of...not sketching.. These a wonderful! I realize I need to sketch more too. I was wondering though, do you do in construction guidelines for these doodles or do you just go to? I agree, faces always tend to be the most fun to doodle. Always great to see your drawings! You should write a book just on the topic on how to draw those cute cartoony girls. When I clicked on your blog, before I started to read I thought these sketchs where layouts with words for a commitioned piece of work. Somthing for advertising. I really love your rough stuff.It just flows beautifully.Lots of wonderful appeal.I hope you continue to post more drawings. 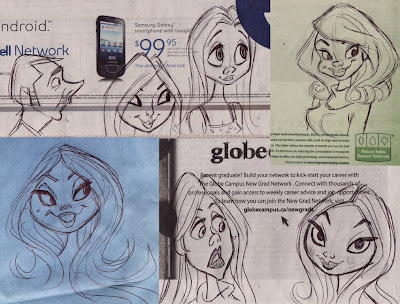 I love to do the same thing, except my faces are not cute cartoons...they are usually weird looking men. And I just wanted to tell you that I too LOVE the feeling of a ballpoint pen on the soft texture of a few layers of newspaper. It's amazing how one can get lost there. Thanks for sharing your doodles...which I think are frame worthy. I'd totally decorate my house with those. could u post a tutorial on how you use guidelines for profiles and 3/4 views - when a person's facial plane is concave/convex? 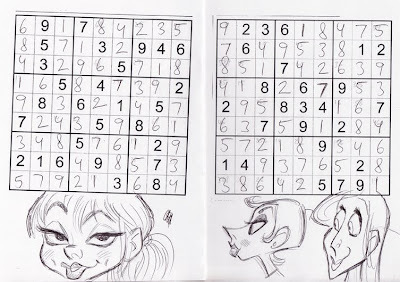 That last doodle looks like she's thinking, oh Pete youre so good at Sudoku! And youre just thinking ya I know. Lovely doodles! Loose and beautiful. Probably my favorite post of yours ever. 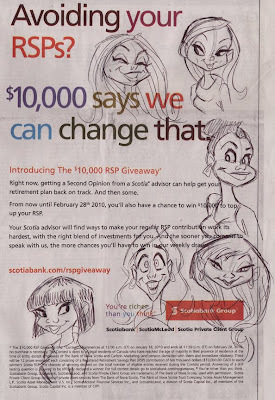 Youre right about ballpoint on newspaper, and the looseness of it all. My best drawings are often the ones on scrap paper. Thanks for reminding me! Now that's some true recycling. love it.